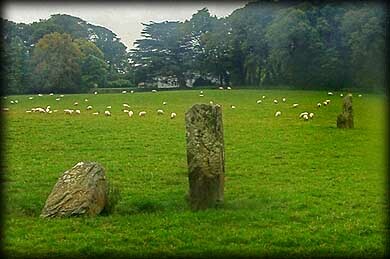 Situated just forty five metres to the northeast of the stone pair at Barryshall are these two standing stones. The tallest stone stands 1.63 metres high and is 1.07 metres wide, it is about 1.8 metres west of the smaller semi-prostrate stone. 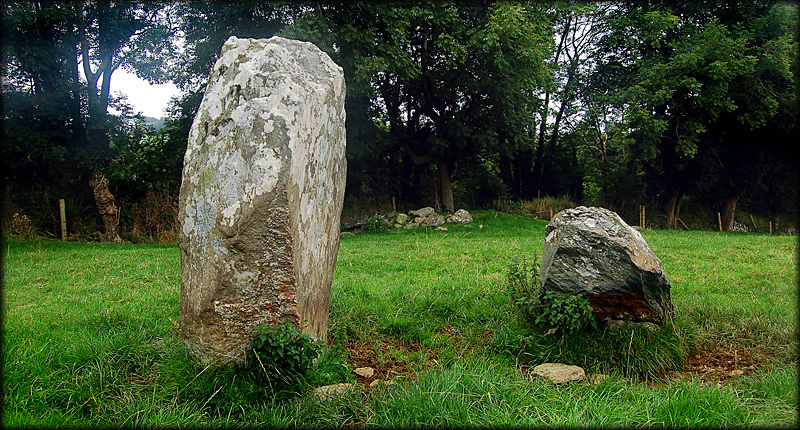 The tallest stone could appear to be in alignment to the stone pair, but the small chunky stone is aligned completely different to any other stone in the field. This really is an odd pair of standing stones. Situated: From Timoleague head south on the R600. After 900 metres turn left at Argideen GAA club. Then turn right at the T-Junction. Drive 400 metres. The stones are in the field on your left. Please ask for permission. Discovery Map 89: W 4620 4278. Last visit Sept 2008.